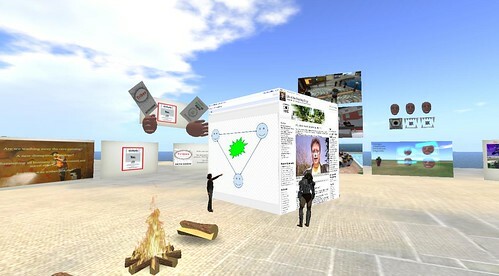 Way back in 2006 when many of us started to use the persistent multi user networked virtual world with self created content (Second Life) in all sort so of place like business and education we thought we were on the cusp of a virtual world revolution. 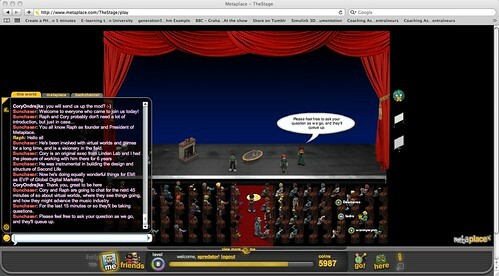 As a metaverse evangelist in a large corporation it was often an uphill struggle to persuade people that communicating in what looked like a game environment was valuable and worthwhile. It is of course valuable and worthwhile but not everyone see that straight away. In fact some people went out of their way to stop virtual environments and the people that supported and pioneered their use. Being a tech evangelist means patiently putting up with the same non arguments and helping people get to the right decision. Some people of course just can’t get past their pride, but you can’t win them all. I also captured many of the events over the course that first year in a larger set along with loads of blog posts on eightbar including this my first public post that always brings back a lot of memories of the time and place. It was a risky thing to post (if you are worried about career prospects and job security) to publicly post about something that you know is interesting and important but that is not totally supported. It seems we are seeing many more mirror world applications appear once more and generally the builds are in Minecraft. It is interesting Minecraft has all the attributes of more detailed virtual worlds like Second Life and Opensim. It is a persistent virtual environment. It has the 8 bit block look and much less detailed and animated avatars, but it does have a very easy approach to building. You stack blocks. You still have to navigate the 3d space get you first person view in the right place and drop a block. (Many of the objects in 2006 were from people who felt they could not navigate 3d space easily something I think that has started to melt away as an objection). The relative resolution of a build in minecraft is low, you are not building with pixels but with large textured blocks. This does have a great levelling effect though. The richer environments require some other 3d and texturing skills to make things that look good. Minecraft is often compared to Lego. In Lego you can make very clever constructions but they still look like Lego. This becomes much less of an visual design challenge for those people less skilled in that art. A reduced pallet and single block type means not having to understand how to twist graphic primitives, upload textures and consider lighting maps etc. It is a very direct and instant medium. Minecraft has blocks that act as switches and wires that allows the creation of devices that react, but it does not have the feature that I used the most in Second Life and Opensim of being able to write code in the objects. There are ways to write code for Minecraft mods but it is not as instant as the sort of code scripts in objects in more advance virtual environments.Those scripts alter the world, respond to it push data to the outside and pull it back to the inside. It allows for a more blended interaction with the rest of the physical and digital world. 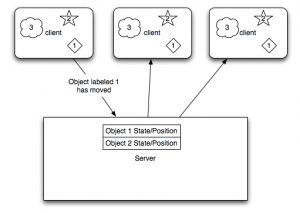 Preserving state, creating user interfaces etc. It is all stuff that can be done with toolsets like Unity3d and Unreal Engine etc, but those are full dev environments. Scripting is an important element unless you are just creating a static exhibit for people to interact in. Minecraft also lack many of the human to human communication channels. It does not have voice chat by default though it is side loaded in some platforms. It has text chat but it is very console based and not accessible to many people. The social virtual worlds thrive on not just positional communication (as in Minecraft you can stand near something or someone) but on other verbal and non verbal communication. The BBC seem to be on a Minecraft vibe just as they were on a Second Life Vibe back in the last wave. Paul Mason and BBC Newsnight came and did a piece with me and the team of fellow Virtual World pioneers in 2007 We were starting to establish a major sub culture in the corporate world of innovators and explorers looking into who we could use virtual worlds and how it felt. Counter culture of this nature in a corporate is not always popular. I have written this before but the day we filmed this for the BBC in the morning I had my yearly appraisal. 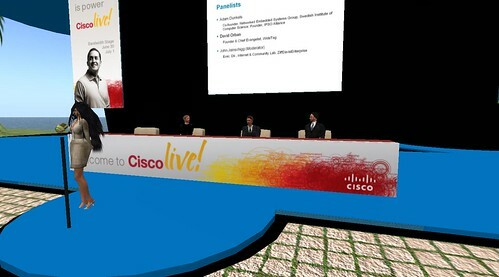 My management line we not keen on virtual worlds not the success so gave me the lowest rating they could. I went straight for that (which is very annoying and disheartening) into an interview with Paul on camera. Sometimes you just have to put up with misguided people trying to derail you, other times you just get out of the situation and go do it elsewhere. Anyway, Minecraft offers a great deal, it does allow mirror worlds, though it does allow for an other worldy approach. Most blocks do not obey gravity. You can build up and then a platform out with no supporting structure, you can dig tunnels and underground (the point of the mine in Minecraft and not worry about collapsing. You still have real world up and down left and right though. Most virtual worlds do this. Disney Infinity, Project Spark, Second Life, Opensim and the new Hi-Fidelity etc are all still avatars and islands at their core. People might mess with the scale of things and the size, size as the OS map or the Hard Drive machines and Guitars mentioned in this BBC piece on spectacular builds. I feel we have another step to take in how we interact at distance or over time with others. Persistent virtual worlds allow us to either be in them, or even better to actually be them. My analogy here is that I could invite you to my mind and my thoughts, represented in a virtual environment. It may not be that those things are actual mirrors of the real world, they might be concepts and ideas represented in all sorts of ways. It may not mean gravity and ground need to exists. We are not going to get to this until we have all been through mirror work and virtual world experiences. That is the foundation of understanding. 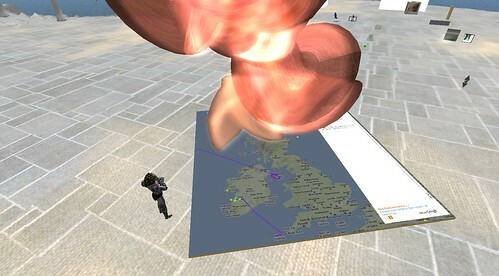 Whilst many people got the virtual worlds of Second Life et al back in 2006 we were only continuing the ground preparation of all the other virtual world pioneers before. Minecraft is the first experience to really lay the foundations (all very serious it is fun to play with too!). These simple 8 bit style virtual bricks are the training ground for the next wave of virtual worlds, user generated content and our experiences of one another ideas. They may be mirror worlds, they have great value. There is no point me building an esoteric hospital experience when we need to have real examples to train on. However there is a point to having a stylised galleon floating in space as a theme for our group counselling experience we created. There is one thing about the virtual world industry. Every day brings something new, some new piece of tech, of content, of gossip or direction. None of which is really every related to an end or a death of it. Companies in all industries (including growing ones) come and go. Companies grow and shrink and restructure all the time. I do feel for all the people hit as part of the Linden restructuring, whether that is a knee jerk need due to cashflow or simply a focussing effort in a company that expanded wildly it does not matter. Those going will be entering a market that is growing, new platforms and businesses are emerging. Those staying can focus and keep Second Life on track. Being in the tech industry it is clear that more than ever it is possible to work and grow without being part of larger company. There are lots of opportunities out there. Linden has been restructuring for some time as we have all noticed. It is because of the direct connection many people/residents/users of Second Life have with the entire company that this sort of move becomes so visible. In most other firms a reshuffle or closure makes little or no difference to any customers. Its just another faceless job swap, with a both survivor guilt for those remaining and mixed emotions for those sent out into the wold once more. Many companies should learn from LL’s ability to let everyone interact at all levels, equally it should make sure that it does not lose that spirit as it becomes more “regular” in its approach as business. It is not the end of anything, but a next chapter and new beginning. (Though I am sure the press will write otherwise). If you are an ex-linden and have some downtime/gardening leave/breathing space. Opensim, Unity3d, vastpark and a few others are worth looking at. If I can help anyone I will, there are lots of interesting projects. I actually get asked a lot about how Unity3d stacks up against Opensim/Second Life. This question is usually based on wanting to use a virtual world metaphor to replicate what Opensim/Second Life do but with a visually very rich browser based client such as Unity3d. There is an immediate clash of ideas here though and a degree of understanding that Unity3d is not comparable in the usual sense with SecondLife/OpenSim. At its very heart you really have to consider Opensim and Second Life as being about being a server, that happens to have a client to look at it. Unity3d is primarily a client that can talk to other things such as servers but really does not have to to be what it needs to be. Now this is not a 100% black and white description but it is worth taking these perspectives to understand what you might want to do with either type of platform. Everything from an Opensim style server is sent to all the clients that need to know. The shapes, the textures, the position of people etc. When you create things in SL you are really telling a server to remember some things and then distribute them. Clearly some caching occurs as everything is not sent every time, but as the environment is designed to be constantly changing in every way it has to be down to the server to be in charge. Now compare this to an “level” created in Unity3d. Typically you build all the assets into the unity3d file that is delivered to the client. i.e. its a stand alone fully interactive environment. That may be space invaders, car racing, a FPS shooter or an island to walk around. Each person has their own self contained highly rich and interactive environment, such as this example. That is the base of what Unity3d does. It understands physics, ragdoll animations, lighting, directional audio etc. All the elements that make an engaging experience with interactive objects and good graphic design and sound design. Now as unity3d is a container for programming it is able to use network connectivity to be asked to talk to other things. Generally this is brokered by a type of server. Something has to know that 2,3 or many clients are in some way related. 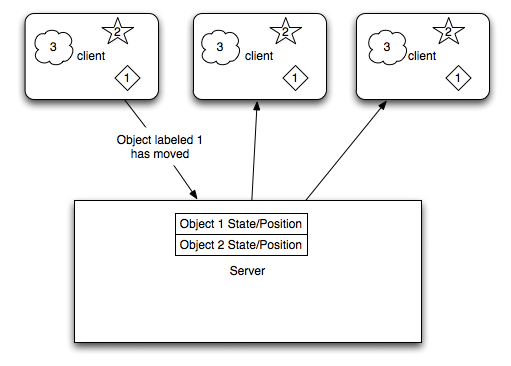 The simplest example is the Smartfox server multiplayer island demo. Smartfox is a state server. It remembers things, and knows how to tell other things connected to it that those things have changed. That does not mean it will just know about everything in a unity3d scene. It its down to developers and designer to determine what information should be shared. In the case above a set of unity clients all have objects numbered 1, 2 and 3 in them. It may be a ball, a person and a flock of birds in that order. When the first client moves object number 1 smartfox on your own remote web server somewhere in the ether is just told some basic information about the state of that ball. Its not here now its here. Each of the other unity clients is connected to the same context. Hence they are told by the server to find object number 1 and move it to the new position. Now in gaming terms each of those clients might be a completely different view of the shared system. The first 2 might be a first person view, the thirds might be a 2d top down map view which has no 3d element to it at all. All they know is the object they consider to be object number 1 has moved. In addition object number 3 in this example never shares any changes with the other clients. The server does not know anything about it and in the unity3d client it claims no network resources. This sort of game object is one that is about atmosphere, or one that has no real need to waste network sending changes around. 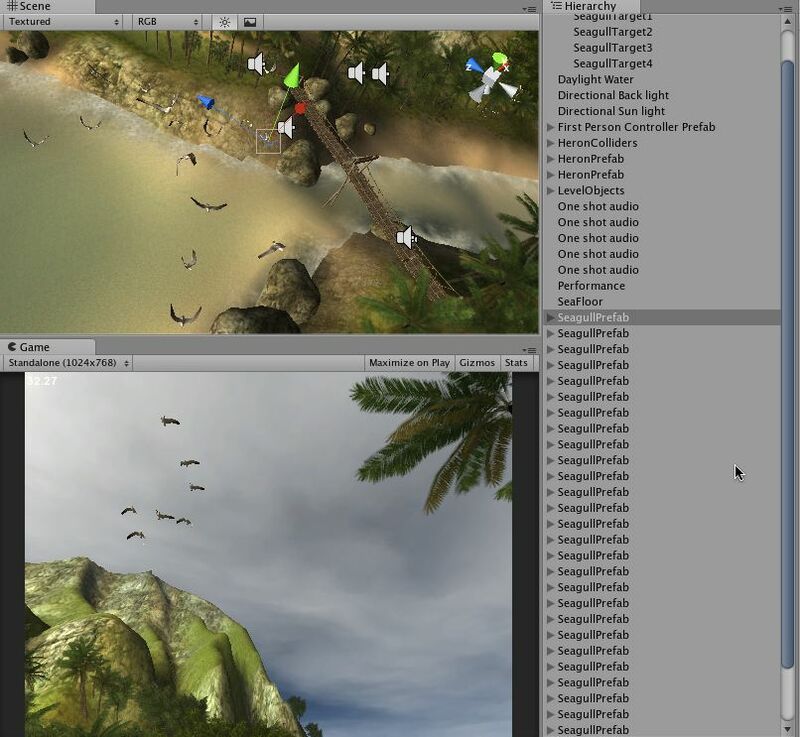 In the island example form unity3d this is a flock of seagulls on the island. They are a highly animated, highly dynamic flock of birds, with sound, yet technically in each client they are not totally the same. For each user they merely see and hear seagulls, they have a degree of shared experience. Games constantly have to balance the lag and data requirements of sending all this information around versus things that add to the experience. If multiplayer users need to have a common point of reference and it needs to be precise then it needs to be shared. e.g. in a racing game, the track does not change for each person. However debris and the position of other cars does. In dealing with a constantly changing environment unity3d is able to be told to dynamically load new scenes and new objects in that scene, but you have to design and decide what to do. Typically things are in the scene but hidden or generated procedurally. i.e. the flock of seagulls copies the seagull object and puts it in the flock. One of the elements of dealing the network lag in shuffling all this information around is interpolation. Again in a car example typically if a car is travelling north at 100 mph there if the client does not hear anything about the car position for a few milliseconds it can guess where the car should be. Very often virtual worlds people will approach a game client expecting a game engine to be the actual server packaged, like wise game focused people will approach virtual worlds as a client not a server. Now as I said this is not black and white, but opensim and secondlife and the other virtual world runnable services and toolkits are a certain collection of middleware to perform a defined task. Unity3d is a games development client that with the right programmers and designers can make anything, including a virtual world. Rezzable have been working on a unity3d client with opensim, specifically trying to extract the prims from opensim and create unity meshes. Unity3d and voice is another question. Even in SL and Opensim voice is yet another server, it just so happens than who is in the voice chat with you is brokered by the the main server. Hence when comparing to unity3d again, you need a voice server, you need to programatically hook in what you want to do with voice. As I have said before though, and as is already happening to some degree some developers are managing to blend thing such as the persistence of the opensim server with a unity3d client. Finally in the virtual world context in trying to compare a technology or set of technologies we actually have a third model of working. 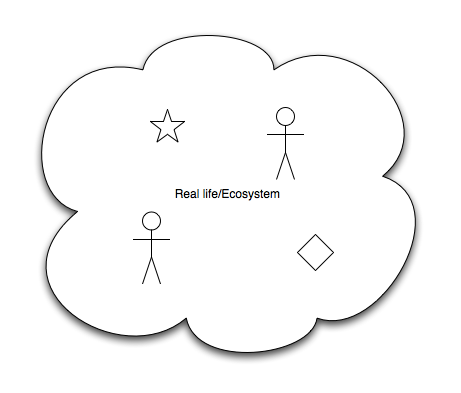 A moderately philosophical point, but in trying use virtual worlds to create mirror worlds at any level will suffer from the model we are basing it on, name the world. 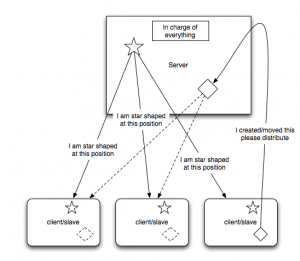 The world is not really a server and we are not really clients. We are all in the same ecosystem, what happens for one happens for all. I keep finding myself bemused by the anti-slviewer2 comments in Second Life. Yes a few things are in different places, the colours have changed, but….. you get to interact with content in a whole different way with the media containers and true web on a prim. It may be that many people not being builders will not find a space to create an surface and mess with the texture settings to get access to this great addition. However I have shown a number of people some very powerful things very very quickly. For me that is all win! Yesterday I was in world when we had the great British Airways storm the front moment as their planes headed to an ashcloud closed UK. We all became plane spotters on http://www.flightradar24.com/ watching the stacking trails as the natural disaster met health and safety met commercial pressure. I augmented my experience by happening to be in SL and stuck a web on a prim under my previously created gas cloud sculpture. It just added to the experience. Not only watching live flights and a historic moment but being logged into my favourite virtual world and embedding the data into it. 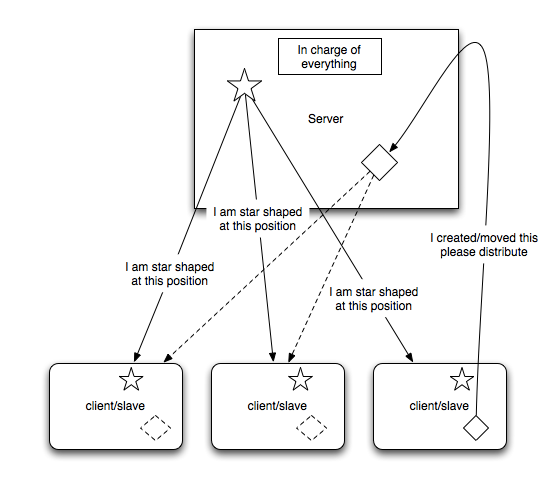 The real kicker though is how easy it is now, in particular with googles new google draw to work on shared diagrams. Yes whiteboards are just a click away. Being a web app you can also have people contribute who are not in world with you. You can leave a diagram and come back to check multiple updates later or work on it all collaboratively seeing the effect of one anothers work as it happen. You know just like standing in a room with someone doing a chalk and talk. I still prefer to use in world objects to get most points across, but sometimes, just sometimes scrawling on a wall does it for me. I hope that if one thing good comes out of the air travel confusion it is a whole host of people asking “isn’t there a better way to work than emailing these attachments around and having telephone calls”. Of course many of us know there is, and regularly use them. The ability to do up to 8 shared screens, so above we have both a whiteboard and my previous post and video on working differently available side by side. The option to use a forced privacy method by having the web page as a hud gives all sorts of options. I am still experimenting with how wearing the web can be used for some interesting effects too. Its all good, give it a try. It sort of works. 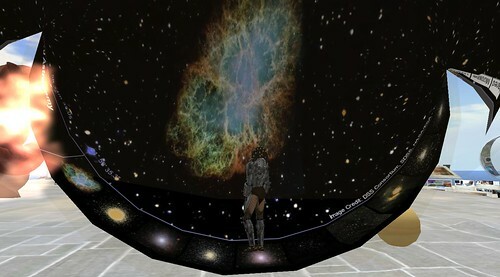 Of course if you do put a web surface on the inside of a sphere and want to drive it you have to be able to click on it 🙂 I think there is some scope for some interesting holodeck effects and animations though using web content. The next few days as we all get to download and use it we will see how the changes and improvements affect us all. It should be good, as its been a long time coming. Lets see though. 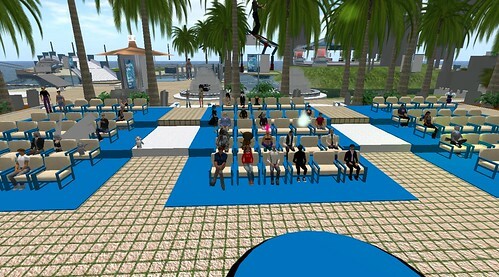 Yesterday the enterprise 2.0 conference saw the official release and announcements relating to Second Life Enterprise and of course featuring some preferred content in the form of Rivers Run Red’s Immersive Workspace and more to come via the Work Marketplace. It is interesting to see this happen both at something like an enterprise 2.0 conference and focussed as a packaged product in the way it is. Back in April 2006 thru to Dec 2006 (which seems a very long while ago now) we said to one another as we (those early eightbars) realised that there was a huge scope for internal corporate communication…. wouldn’t this be great behind our firewall? By September 2006 (after the first Wimbledon in Second Life) the US based CIO office had realised the potential and a few of us from places not just in the US ended up on that growing project to understand SL and all the other platforms and their implications to an internal corporate audience. This also started to lead to the more commercial based business unit forming, which interestingly is now part of the CIO office according the communications out of IBM. This journey and the things that happened on the way (good and bad) all form part of the story I share with people in various ways including the in progress book on the subject. Linden Lab focussing on enterprise and producing a product, however it is priced and packaged is an important further catalyst to this industry, one that those of us in IBM, Cisco, Sun etc. started to generate corporate and public interest in through our patronage. However this is now happening (unlike in 2006) in an era that has very many more potential direct competitors. many have been there for a while but will now be dropping into even more invitation to tender conversations, Proton Media, Forterra Olive, Teleplace, web.alive…. Equally there will be an increasing drive in take up of the hosted and self hosting services based on Opensim (SecondPlaces, ReactionGrid, Rezzable and SimHost ). Other platforms and standards such as Vastpark, or Wonderland for those who want to still explore and drive forward and develop things for themselves and get a step up on the packages. Services such as Venuegen, specialized in providing a particular quick access service also start to take a share of the market. It is of course a huge market, business/enterprise communication relates to every employee in every company that has any form of electronic or remote communication. Like email, web and increasingly instant messaging and voip and social media in general it is essential business addresses the communication gaps we have generated. All these options may be confusing, but just pick one and get on with it! I also still expect an actual games company to realize that their middleware and massive scaling and runtime abilities can be applied to a spin off market. So rather that enterprise business trying to figure out how to use games, games will figure out how to use enterprise business. With some of the developments this week too such as Unity3d becoming free to develop with and also Unreal 3 doing the same to some extent the future looks very rosy and very interesting. However….. remember that the problems and challenges are not wholly technical. We are dealing here with social and cultural change. Something else I have experienced both the good and bad of and happy to share if you need to talk about the implications to your business, industry or life. My feeds today led me to look at a brilliant YouTube video that is over on New World Notes called Impressions by Willow Caldera. This video is wonderfully shot and shows a the very creative and expressive side of Second Life. It acts as a reminder (probably to those of us who preach about “business use” or who are starting to finally grok it all that there is much much more to all this than a bit of powerpoint and some business dressed avatars. I would recommend popping over to NWN and taking a look. In following the links I saw this video too on the same channel about the U2inSL Warchild benefit gig. U2 are back in the news again for using Youtube themselves (as opposed to this U2inSL who are a tribute act). 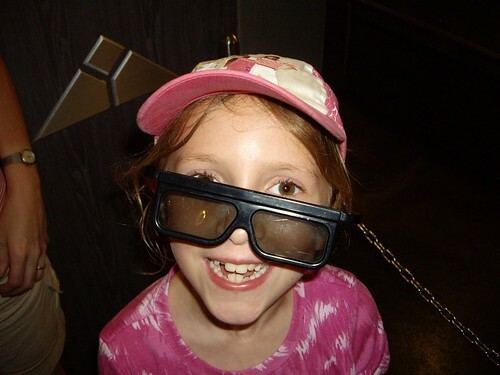 However I still always manage to get U2inSL into any explanation of what this is all about. 1. Most people know who U2 are they are both part of the establishment and known innovators. 2. People listen to music all the time on the Radio, Ipods etc. 3. Bono is particularly known for charity work too. Each of those have a way to reach people who don’t yet understand why we are all harping on about virtual worlds. Love or hate U2 it acts as personal conversation rather than a business one. What happens at the concerts (as you can see from the video) is effectively a tribute act puppet show/impersonation. Yet it also has a crowd of people willing to watch listen and feel part of it. They are all passionate U2 fans, and they have gathered together to raise some real money for charity by collectively listening to their favourite tunes together. Underlying all that we of course end up with copyright and image rights conversations, but in the case of U2inSL this really is a passionate fan base enjoying feel connected rather than someone making fake gucci bags for a quick buck. As many of us keep pointing out, engaging and supporting these passionate fans whether you are a band, an author, a manufacturer of widgets is the key to the world today. Where those people happen to be and the way they are choosing to interact with one another is where you need to be joining in. Not a huge capital investment, not masses of PR and spin but just good old fashioned human to human conversation. Twitter, SL, Facebook…. whatever comes next, you just have to be there.